WCS Archives holds a number of collections that tell the story of the New York Zoological Society and its activities in the realm of public affairs. A portion of these materials relate to the former Department of Government Affairs which, from the period of the 1960s-1980s, produced records that serve to provide a snapshot into the Society’s contributions towards wildlife conservation legislation. During the 1960s to 1980s, NYZS underwent a significant period of organizational change. The Society was re-orientating its focus from the exhibition of global wildlife within its urban zoological park, to further fulfilling its greater role in the preservation of wildlife and ecosystems through increasing national and international activities in research and conservation. “For it was never intended, from the beginning, that the Zoological Society’s interests should be bounded by the fences around the Zoo and Aquarium.” – Fairfield Osborn. President, 1940-1968. New York Zoological Society. (NYZS 1977 Annual Report, cover page). Internationally, research and conservation activities included field studies carried out in the Serengeti (1965), Uganda (1966), Tanzania (1967), and China (1980). Establishment of wildlife areas and reserves in countries including Bolivia (Laguna Colorada Reserve, 1960), Argentina (coastal reserves including Punta Tombo and Península Valdés, 1969), Belize (Cockscomb Basin, 1984), and Brazil (Sustainable Development Reserve via NYZS Mamiraua Lake Ecological Station 1989), were supported by the Society’s research and conservation related activities in those regions. Ecotourism collaborations in the 1970s and 1980s included the program created in Rwanda’s Volcanoes National Park in 1979, and developmental contributions towards Kenya’s Wildlife Service Nairobi Safari Walk in 1987. The first zoo-based field veterinary program was initiated in 1989. 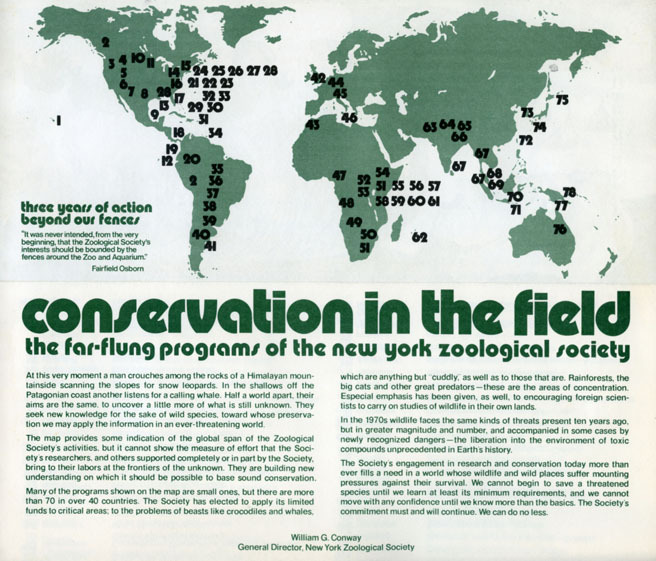 Reverse side of “Conservation in the Field” promotional pamphlets, circa 1970s. Scanned from WCS Archives Collection 2018. Closer to home, NYZS worked with Rockefeller University to establish the Institute for Research in Animal Behavior in New York, 1965. The Center for Field Biology and Conservation and the Society’s first Conservation Department emerged during the 1970s. Also during this decade, the Society launched its special endangered species and study facility, the Wildlife Survival Center on St. Catherines Island, Georgia in 1974-75, and the Animal Research and Conservation Center in 1980s. 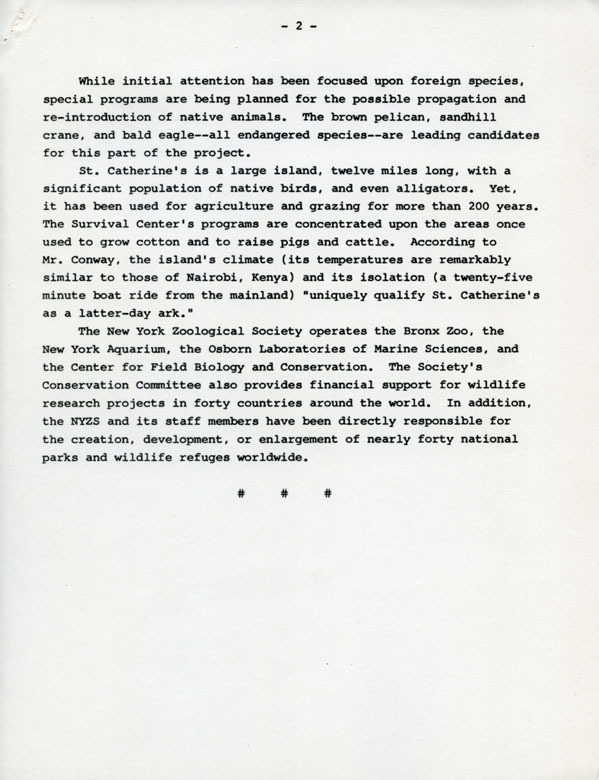 Press release for the opening of the Wildlife Survival Center on St. Catherines Island, Georgia, page 1, circa 1974-1975. Scanned from WCS Archives public affairs collections. The Wildlife Survival Center assisted the Society’s efforts in the propagation of endangered species. In 1985, the Animal Health Center opened at the Bronx Zoo, featuring modern facilities and equipment and replacing the old Animal Hospital, which had opened in 1916. From its earliest beginnings, NYZS has been supporting and lobbying for wildlife and ecosystems related conservation issues. In the first quarter of the 20th century, the Society already had an early track record of advocacy and campaigning including: the support for the prohibition of illegal trade in wildlife, fish and plants resulting in the passing of the Lacey Act of 1900; promoting early wildlife conservation treaties such as the Fur Seal Treaty of 1911; the drafting of language in the legislation that prohibited the use of bird plumage in the millinery trade, the 1913 Tariff Act; and long-term campaigning that resulted in the passing of the Migratory Bird Conservation Act of 1930. Many of these activities are attributed to the tireless efforts led by the Society’s first Director for the New York Zoological Park (Bronx Zoo), William Hornaday. This progress was continued throughout the 1960s-1980s, led by the General Director and President of the Society William Conway and senior staff member and Curator of Reptiles F. Wayne King. Highlights in Conway and King contributions include their status as U.S. delegates appointed to the conference which established the Convention on International Trade in Endangered Species of Wild Flora and Fauna (CITES), and eventually led to the creation of key legislation to carry CITES provisions out, the Endangered Species Act of 1973. Other highlights include the advisory role of King in his role as Chairman of the Wildlife Conservation Committee of the American Association of Zoological Parks and Aquariums (AAZPA), now the Association of American Zoos and Aquariums (AZA), in the evaluation of governmental endangered species importation permit applications in the early 1970s, and the foundation and development of the Species Survival Program of the AAZPA by Conway in 1982. In this same vein, there are several items of note which appear in the selection of records of the former Department of Government Affairs currently being preserved and made available through this year’s NHPRC grant-funded project. 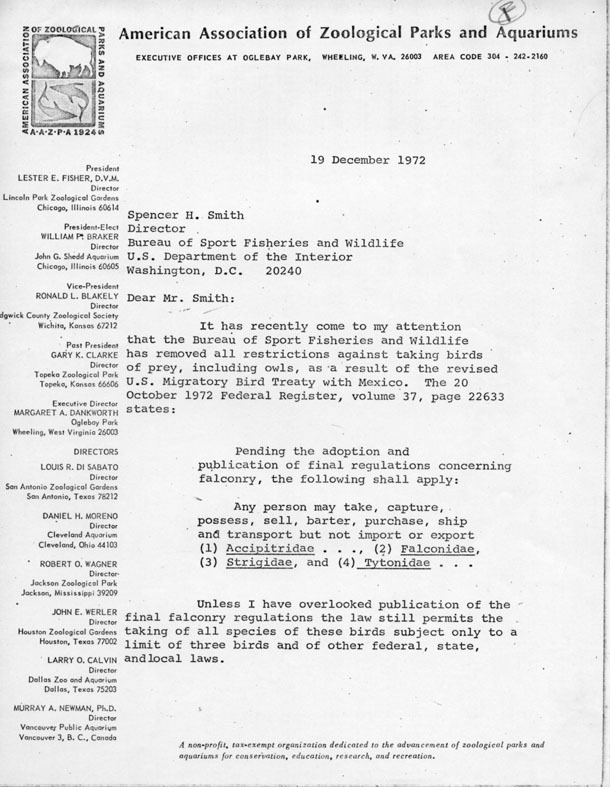 Letter from F. Wayne King, Chairman of the American Association of Zoological Parks and Aquariums’ Wildlife Conservation Committee, to the Bureau of Sports Fisheries and Wildlife, United States Department of the Interior, 1972. Scanned from WCS Archives Collection 2018. 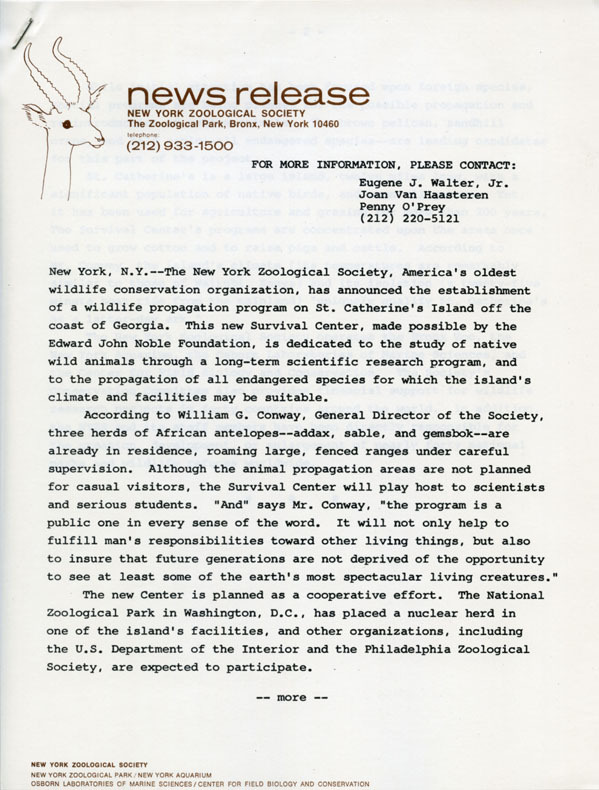 In the early 1970s, written letters provide evidence of the Society’s active support in advocating for wildlife preservation through legislative means. 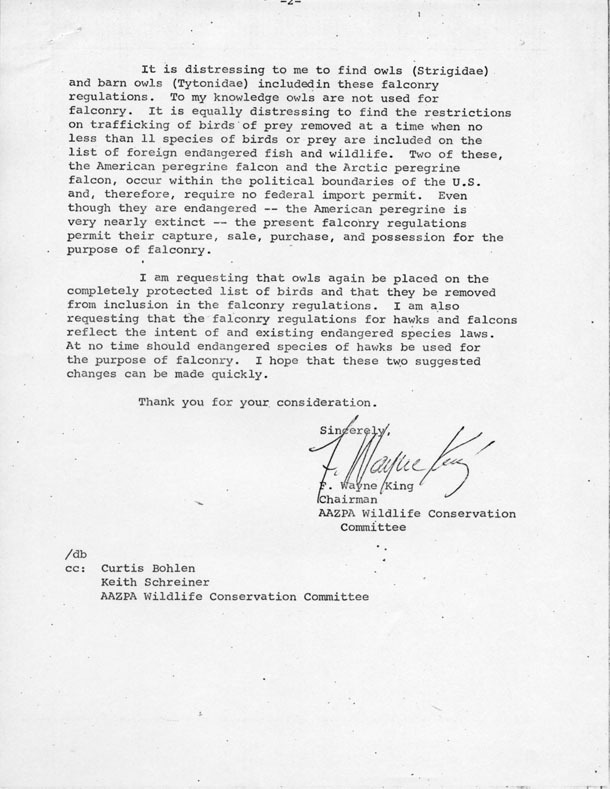 Among these is the letter shown above between King, in his role as Chairman of AAZPA’s Wildlife Conservation Committee, to the Bureau of Sports Fisheries and Wildlife, U. S. Department of the Interior, which highlights and advocates for the protection of bird of prey species at risk (owls, hawks, falcons) under existing federal endangered species laws, and amending harmful sports hunting laws. Surviving correspondence in these files in the early years before and after the Endangered Species Act of 1973 give an insight into important relationships the Society exercised and cultivated with governmental conservation partners closer to home, furthering its mission to save wildlife and wild places worldwide through conservation action. This post was submitted by WCS’s National Historical Public Records Commission (NHPRC) Project Archivist, Emma Curtis.